Stoichiometry is a quantitatve process. Given an initial mass or volume of reactant or product, the molar relationships between reactants and products in a chemical reaction are used to calculate a specific mass or volume of another reactant or product. 3. Answer the question - convert the moles of the desired compound to the appropriate quantity (i.e. mass, volume). When unsure of what the question is asking, look for clues in the wording. If a phrase such as "find the number of grams" is used, the unit grams indicates that the mass should be found. Determine the mass of iron that is produced from 25.36 g of iron(III) oxide. Determine the volume of carbon dioxide gas that will be produced from 112.5 grams of iron at STP. First, it's important to understand the concept of STP, standard temperature and pressure. Standard temperature and pressure is a set of conditions (273.15 K and 1 atm) at which 1 mole of any ideal gas will occupy 22.414 L. As a conversion factor, 1 mole gas = 22.414 L.
What is the volume of ammonia gas will react with 22.5 L of oxygen gas? Note that the first and last step in a volume-volume problem will cancel each other. This is because the first step, converting to liters of oxygen to moles, requires a division by 22.414. In the third step, conversion of moles of ammonia to liters, requires multiplication by 22.414. These two steps cancel each other and render step two (mole to mole ratio) the only important step. It needs to be stressed that this only happens in a volume-volume problem. The ideal gas law, PV=nRT, must be used to finish this problem. The variable P represents pressure, and must be in atm. The variable V is the volume, and is what we are solving for. The variable n represents moles, and 0.4764 will be substituted into the equation here. 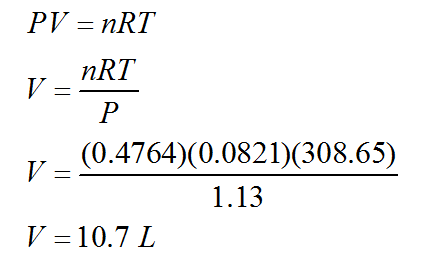 The variable R is the gas law constant and has a value of 0.0821. Its units are atm • L • mol-1 • K-1; note how the unit incorporates the units of all the other variables. It is for this reason that pressure must be in atmospheres. The temperature T must be in kelvin. First, let's make the necessary conversions for temperature and pressure. For temperature, to convert degrees Celsius to kelvin, add 273.15. Therefore, 35.5 + 273.15 = 308.65 K. For pressure we must setup a set of proportions using the conversion factor 1 atm = 760 torr. On occasion, a liquid reactant may be used and the mass is not given. Instead, the volume of the liquid is given as the starting quantity. Be careful with this as 22.414 L/mol cannot be used since that is only useful for gases. If lucky, the density of the liquid will be given in the problem. If not, then it must be found in literature. Using the density formula, the mass of the substance can be found (mass equals volume multiplied by density) and from there, the moles of the substance can be found. One last reminder: densities are given in g/mL, so make sure the volume of liquid given in the problem is also given in milliliters. What mass of iron will be produced from 25.00 g of iron(III) oxide and 25.00 g of carbon monoxide? The solution is similar to the mass-mass problem from before, except there are two problems being solved at the same time. The reactant that produces the smaller mass (or volume for a gas) of product is the limiting reactant. The limiting reactant always dictates the mass/volume of product that is produced, therefore the smaller quantity of product is always the solution to a limiting reactant problem. In the last problem it was imperative for us to calculate which reactant was consumed first because the reaction would stop at that point. The mass of products had to be determined from this substance, which was called the limiting reactant (Fe2O3). The other substance that was not fully consumed (CO) is the excess reactant. The mass of carbon monoxide that is consumed can be calculated, and the mass of carbon dioxide that remains unreacted can also be found. In order to do so, a stoichiometry problem must first be completed in which the limiting reactant is used to calculate the mass of excess reactant consumed. Utilize the list of reactions and find a specific reaction for mass/mass, mass/volume, and volume/volume calculations. Given the reaction that follows, find the volume of sulfur dioxide gas that will be produced from 25.36 mL of 0.966 M hydrochloric acid at STP. This problem is unique in that there are two numbers given within the problem, but since they are not values for different compounds, it is not a limiting reactant problem. The volume and molarity given must be used to find the number of moles of HCl. From there, the rest of the problem continues in the same manner as previous problems. Note that the volume must be converted to liters. The molarity formula does not need to be done separately as it can be included into the normal dimensional analysis setup. Notice the units of the first two ratios. The first value is strictly liters, the unit for volume. The next ratio's units are mol/L, the unit for molarity, and when multiplied by the first value it is the equivalent of n = M×V. 19.52 mL of 0.285 M sulfuric acid was needed to titrate 42.81 mL of sodium hydroxide. Find the molarity of the sodium hydroxide. Since the problem explicitly states that the molarity of sodium hydroxide is the unknown, then we must have enough information to start with sulfuric acid. Upon inspecting the values again, it can be seen that both the molarity and volume of sulfuric acid are given, enough to find moles of sulfuric acid and complete the problem. What will be the volume of carbon dioxide produced at STP from the full combustion of 45.0 mL of ethanol? The density of alcohol is 0.789 g/mL.